1967 Chevrolet Camaro drifting like a boss! 1967 Chevrolet Camaro drifting , Raffaele Zanato ,The speedshop tenant garage and a passion for muscle cars – what more is there to want? 2015 was the year of transition for Zanato . Leaving behind his Mustang GT , the pilot decided to replace it with a beautiful 1967 Chevrolet Camaro. The car has been grafted a 6.8L LS3 V8 engine , tuned to 550 hp ! Enough to burn the gum without having to force on the right pedal. 1967 Chevrolet Camaro drifting and makes some serious roars! We therefore leave yo to enjoy in the melodious chant that the American muscle produces. 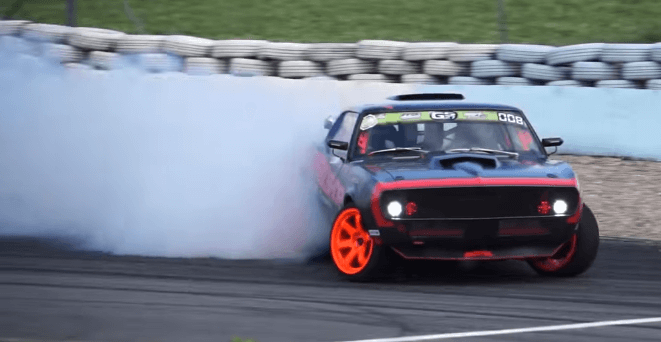 Insane sideways action and some serious tire-smoking in one package – let the fun begin! Check out this 1967 Chevrolet Camaro drifting video below! Meet “Ryno”, the one wheeled motorcycle! 1970 Hemi Blown Rolls Royce Dragster “The Shadow”! Custom Ducati Multistrada “Biuta” by Carlo Roscio!! 2016 Suzuki GSX-S1000 ABS – Best Superbike Of 2016! How to destroy a Corvette in 3 minutes!